Significant security concerns … on your computer … must not be ignored. This is the second of a few posts about this topic. Note I will use ‘3rd Party app’, ‘apps’ and ‘Third Party Software’ interchangeably throughout these postings. In the last post I covered what 3rd Party Apps are and which ones I’m most interested in covering for my clients. This article shares some interesting facts about how many 3rd Party Apps can likely be found on your computer! I will also share important information about updates (the very few you know of, the many you are missing out on! ), ideas about why so much of your software is out of date (and as a result likely very insecure). How many 3rd party apps do you think you have on your computer??? To get the data below you should know that I look at over 100 different 3rd applications on a daily basis and take care of updating them for subscribers of managed services plans I offer. The average number of apps installed per PC is 15! A full 20% of devices we look over have 15 third party apps installed! 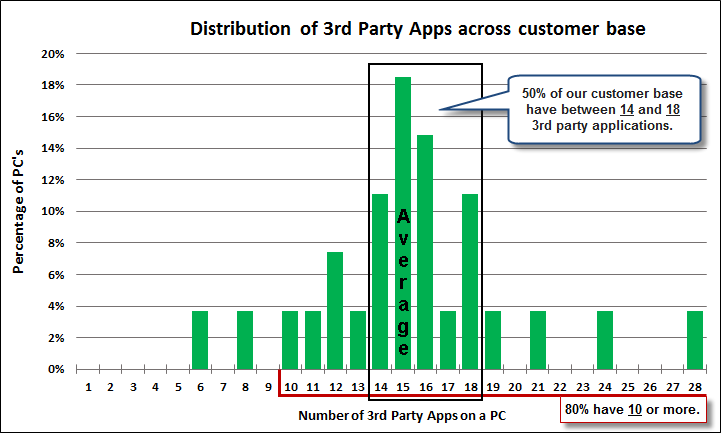 50% of our users (very likely you) have between 14 to 18 apps installed on their PC. 50% of our users have 15 or more apps (up to 28). 80% of our user base have 12 or more; 90% have 10 or more; 95% have 8 or more. No matter how you look at it the odds are that you have many more 3rd party apps installed on your computer than you ever imagined and the software developers that create these applications are releasing important updates all the time. You can click here to get to part 3 of this topic. This entry was posted in Maintenance, Managed Services Plan, Security, third party software and tagged Computer Maintenance, Maintenance, Managed Services Plan, Planned Maintenance, security, Third Party Software. Bookmark the permalink.